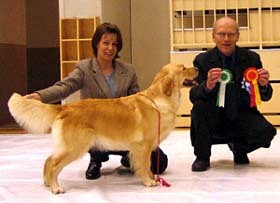 Helsinki, Nordic Winner 2005 18.12. 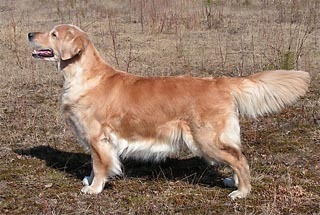 Qualified for Crufts 2006 or 2007.
moves freely with good style & temperament, good coat and colour, well presented. 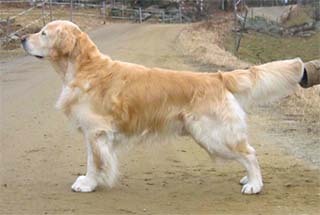 A golden with a bright future." Eye check day for Macy, Windy, Voitto and Sissi. They all have clear eyes. 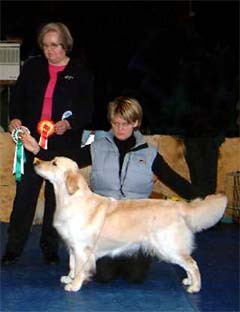 Gladtail Heaven Can Wait qualified in the field. -> Candy got the title Fin Ch !! Also Tattood Smew qualified in the field. 1st prize at Open class with 47 points ! I'm so proud of you, Dante and Lari !!! Congratulations Diki and his family ! 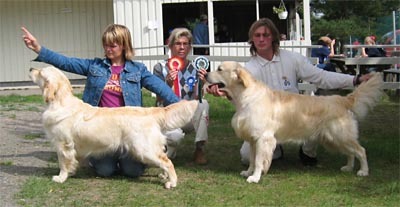 2nd prize at Open class with 31 points. Congratulations Aino and Niina ! 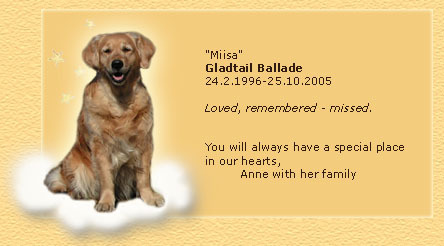 (Gladtail Heaven Can Wait) fiance. 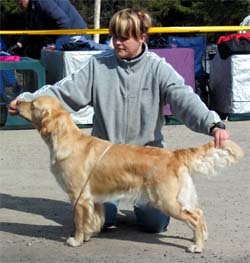 Ch Trialer Xanthos Pickpocket "Fred" take part also in Parikkala show. Best dog, BOS and CC. 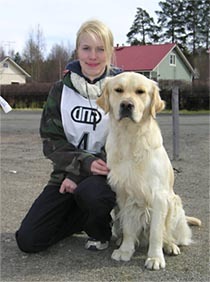 So Fred became Finnish Champion ! Congratulations Tatiana and Fred ! BH Gladtail Irish Kiss "Juuso" and Johanna surprised us gladly ! 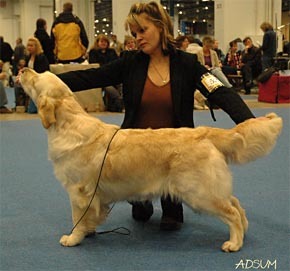 "Excellent tracking, handler behaved so quietly and totally trusting her dog." Well done Juuso and Johanna ! 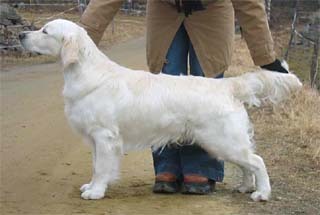 Gladtail K-litter one year ! Congratulations to Aino, Ansa, Kapu, Kaapo, Masi and Dante ! 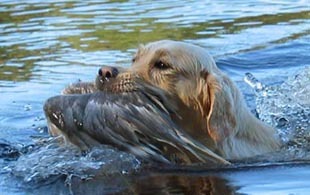 is now also Fin Tracking Ch ! Warmest congratulations to Diki and Jussi for their great job ! 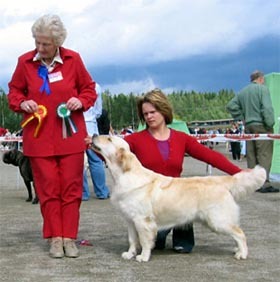 Now the first Gladtail Tracking Champion is made which makes the breeder so proud and happy. 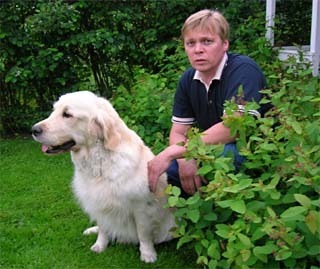 thank you Jussi having the energy to wade in the woods with Diki ! Tracking trial 1st prize at Winner class ! Well done Diki and Jussi ! 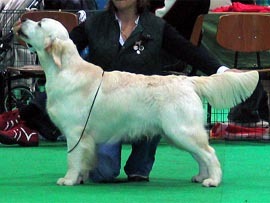 the first Gladtail golden taking part of BH-test and the result was qualified (title BH). Congratulations Juuso and Johanna ! Well done Digi and Jussi ! 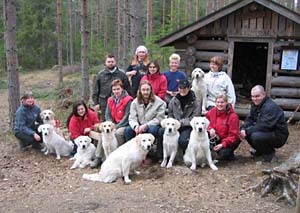 All of 6 puppies were along with their families. Thanks for all for the nice day ! the first Gladtail-litter 11-years ! 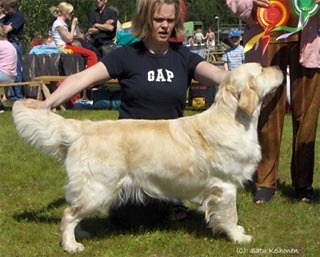 was awarded the title of the Most Beautiful Show Retriever Puppy of the year 2004 by Keski-Suomen Nuuskut. Happy birthday to Aleksi, Tuffe, Riina, Lace, Julia, Miisa and Zantte ! Happy birthday to Diki, Brando, Tomi, Jalo, Leo, Peggy, Sere, Dixie and Macy ! Uno celebrates his one year birthday ! 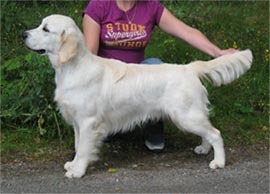 Breeder sends warm congratulations and hugs to all of you 'little puppies' ! Voyage du Bois de la Rayère. warmest thanks to Catharina for helping us to have this French boy. kennel du Bois de la Rayère, for this most charming guy ! Gladtail Key to Heart 3. 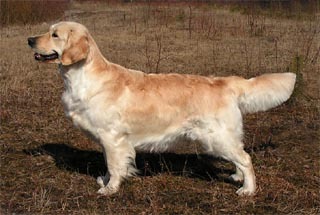 Gladtail Keep the Faitht 4.